During the discussion on the Iran nuclear deal, it has been strange to hear US politicians fiercely condemn Iranian human rights abuses while remaining silent about worse abuses by US ally Saudi Arabia. Not only is the Saudi regime repressive at home and abroad, but US weapons and US support for the regime make Americans complicit. So let’s look at the regime the US government counts as its close friend. 1. Saudi Arabia is governed as an absolutist monarchy by a huge clan, the Saud family, and the throne passes from one king to another.The Cabinet is appointed by the king, and its policies have to be ratified by royal decree. Political parties are forbidden and there are no national elections. 2. Criticizing the monarchy, or defending human rights, can bring down severe and cruel punishments in addition to imprisonment. Ali al-Nimr was targeted and arrested at the age of 17 for protesting government corruption, and his since been sentenced to beheading and public crucifixion. 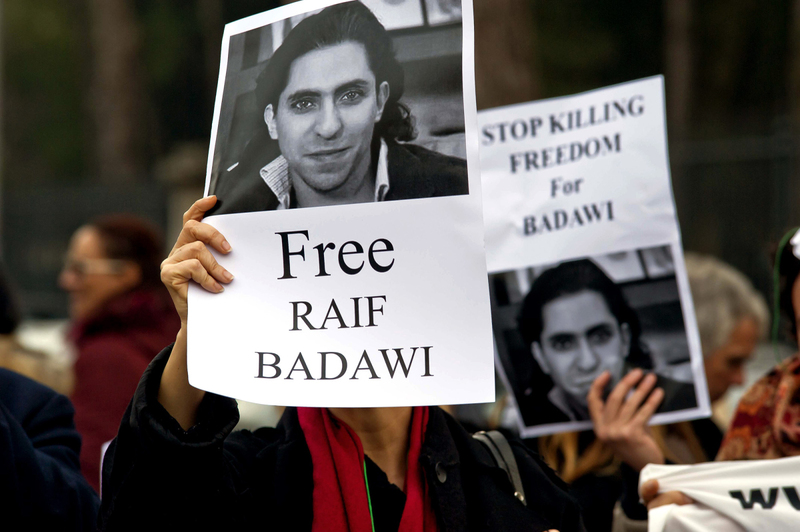 Raif Badawi was sentenced to 10 years in prison and 1,000 lashes for writing a blog the government considered critical of its rule. Waleed Abulkhair is serving a 15-year sentence for his work as a human right attorney. New legislation effectively equates criticism of the government and other peaceful activities with terrorism. The government tightly controls the domestic press, banning journalists and editors who publish articles deemed offensive to the religious establishment or the ruling authorities. Over 400,000 websites that are considered immoral or politically sensitive are blocked. A January 2011 law requires all blogs and websites, or anyone posting news or commentary online, to have a license from the Ministry of Information or face fines and/or the closure of the website. 5. There is no freedom of religious. Islam is the official religion, and all Saudis are required by law to be Muslims. The government prohibits the public practice of any religion other than Islam and restricts the religious practices of the Shiite and Sufi Muslim minority sects. Although the government recognizes the right of non-Muslims to worship in private, it does not always respect this right in practice. The building of Shiite mosques is banned. 7. The country is built and runs thanks to foreigner laborers, but the more than six million foreign workers have virtually no legal protections. Coming from poor countries, many are lured to the kingdom under false pretenses and forced to endure dangerous working and living conditions. Female migrants employed in Saudi homes as domestic workers report regular physical, sexual, and emotional abuse. 8. The Saudis are funding terrorism worldwide. A Wikileaks-revealed 2009 cable quotes then-Secretary of State Hillary Clinton saying "Donors in Saudi Arabia constitute the most significant source of funding to Sunni terrorist groups worldwide….More needs to be done since Saudi Arabia remains a critical financial support base for al-Qaeda, the Taliban, Lashkar e-Tayyiba and other terrorist groups." In Syria the Saudis are supporting the most extreme sectarian forces and the thousands of volunteers who rally to their call. And while the Saudi government condemns ISIS, many experts, including 9/11 Commission Report lead author Bob Graham, believe that ISIL is a product of Saudi ideals, Saudi money and Saudi organizational support. 10. The Saudis backed a coup in Egypt that killed over 1,000 people and saw over 40,000 political dissidents thrown into squalid prisons. While human rights activists the world over where condemning the brutal regime of Al Sisi, the Saudi government offered $5 billion to prop up the Egyptian coup leader.